Mother’s Day in the UK is this Sunday, the 6th March. So nannies and daddies let’s get your craft on with your children. We’ve thought of a few sweet homemade items for your little ones to make for their mummies. Grab an unvarnished plant pot and cover it with lots of brightly coloured paint. When dry cover the pot in pva glue (it will dry clear, don’t worry!) this will stop the paint from getting ruined from any water spills when you water your plant. Add a pretty plant and you’re done! 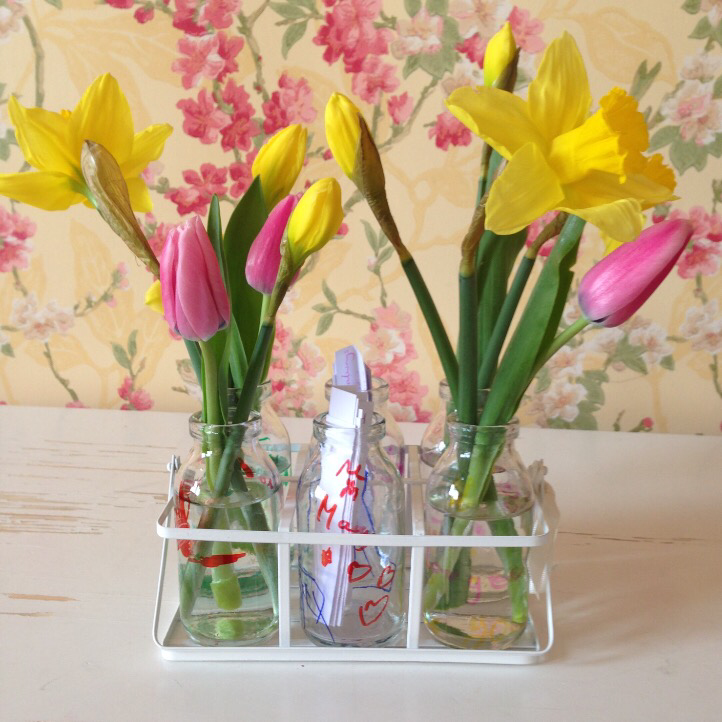 Old fashioned milk bottles look beautiful with some daffodils and this crate of 6 mini milk bottles looks lovely when you fill four with flowers and the other two with hand written notes to mum about why she is so special. Choose a photo frame with a wide mount (the card piece that surrounds your photo inside the frame). Take out the mount and using paint, glitter, sequins, pretty scraps of paper etc decorate the mount. We used watercolours on ours. 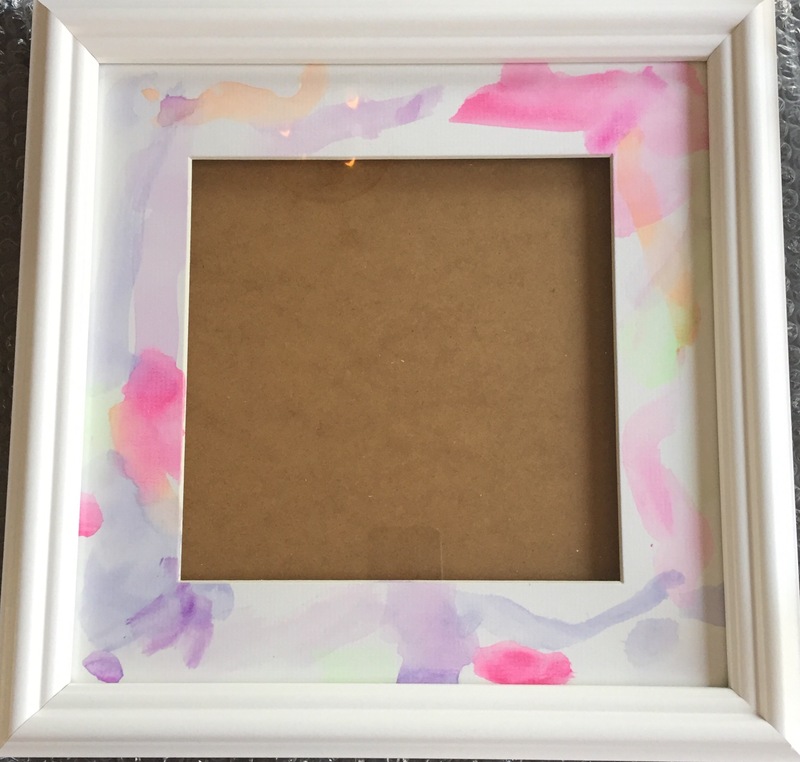 When dry place back into the frame and print a photo of the children to place in the frame. Using Fimo clay, roll out to a 4mm depth and use a cutter of your choice to make a shape. Press child’s finger down into the clay to leave a finger print (or two to make a shape of a heart). You can write a small message on the clay using a cocktail stick and don’t forget to make a hole for the key ring to go through. Bake at 110 degrees for about half an hour. Leave for an afternoon to completely harden and then put the key ring through the hole. You can do one child’s fingerprints on each side of the shape. For this card you’ll need to dye some rice, which also makes a great sensory resource for children (see our sensory trays here). We chose purple food colouring, you will also need a zip lock bag, vinegar, 1 tbsp, and of course the rice, 1 cup. Put the vinegar and food colouring into the zip lock bag, then add the rice. If you have some you could also add some lavender essential oil, which will scent the rice nicely and also hide the vinegar smell. Close the bag, and then shake, shake, shake – the children will love this bit. Leave the rice to dry on greaseproof paper for around 1-2 hours. Alternatively you can pop it into the oven on a very low temperature, be sure to check it frequently. For the making of the card, you will need your coloured rice, pva glue, a piece of card and felt tip pens. Draw some stalks onto the card, and add a flower pot. Next add glue to the top of each stalk and arrange the rice into a lavender shape. Write a message onto the front of the card if you so wish. If you make something for Mothers’ Day, please share your crafts with us either on our Facebook page, Instagram or Twitter.